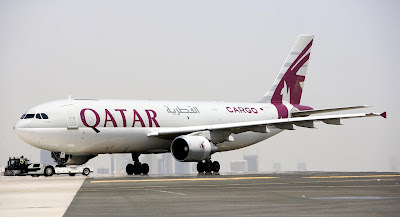 Qatar Airways will establish dedicated freight routes to Hartsfield-Jackson Atlanta International Airport, Houston George Bush Intercontinental Airport and Toronto Pearson International Airport from its Doha hub through Luxembourg next month. Twice-weekly freight flights to Atlanta and Houston will commence on November 2 while Toronto will senjoy weekly service beginning November 7. The flights, which will be performed on Boeing 777F airplane, represent a significant expansion plan for the Middle Eastern carrier. Previously, the only North American city served by Qatar Airways’ cargo division was Chicago. O’Hare International Airport will soon benefit from increased freight service, however, as Qatar increases its frequency to the Midwestern city on October 30. “With the recent completion of our 35 percent stake in Cargolux, Europe’s largest cargo airline, we have enhance our focus on freighter operations, which ties seamlessly into the airline’s strategy to have as a lot of connecting points across the globe from our Doha hub,” Qatar Airways Group CEO Akbar Al Baker said in a declaration. “We have recognized marvelous route expansion opportunities around the world, including North America, where the freighter market is enormous,” he continued. Representatives for the carrier said that daily passenger routes to Washington, New York and Houston, along with thrice-weekly service to Montreal, also offer important bellyhold cargo capability. Only Houston, still, necessitated a dedicated cargo route to address demand. Addressing demand was as well why Qatar Airways selected Atlanta as a destination for cargo service. As the 10th largest U.S. exporter to the Middle East last year, Atlanta offers Qatar Airways “a geographically desirable location for freight carriers and freight forwarders that want to enlarge their global networks with lower operating costs,” Hartsfield-Jackson Aviation General Manager Louis Miller stated. North America isn’t the only cargo market Qatar Airways is eying, still. The Doha-based carrier recently increased its cargo service to Kuwait, Bengaluru, Hanoi and Kozhikode, India. It will also establish weekly cargo service to Jeddah, Saudi Arabia on October 30.